I recently hosted a dinner party for 12 people and wanted to serve cauliflower rice. But the idea of figuring out how to sauté, like, three heads of cauliflower — without the “rice” getting mushy — and how to have it all ready to serve at the same time was overwhelming. I wondered if there was an easier way. 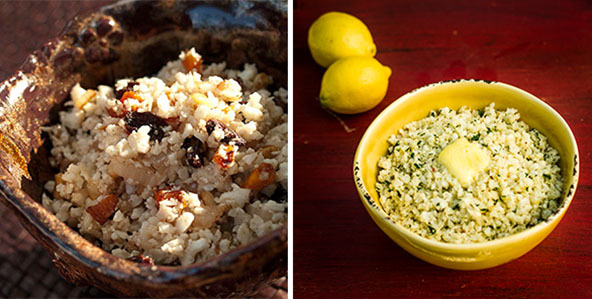 Say hello to Oven-Roasted Cauliflower Rice. The oven-roasted rice is easier to make in large quantities (no stovetop management! ), has a superior texture (no mush! ), and tastes more like rice (nutty flavor!). This is my go-to from now on — even if I’m only making a single batch. Give it a try! Preheat oven to 425F. Cover a large, rimmed baking sheet with aluminum foil. Break the cauliflower into florets, removing the stems. Place the florets in the food processor bowl and pulse until the cauliflower looks like rice. This takes about 10 to 15 one-second pulses. You may need to do this in two batches to avoid overcrowding. 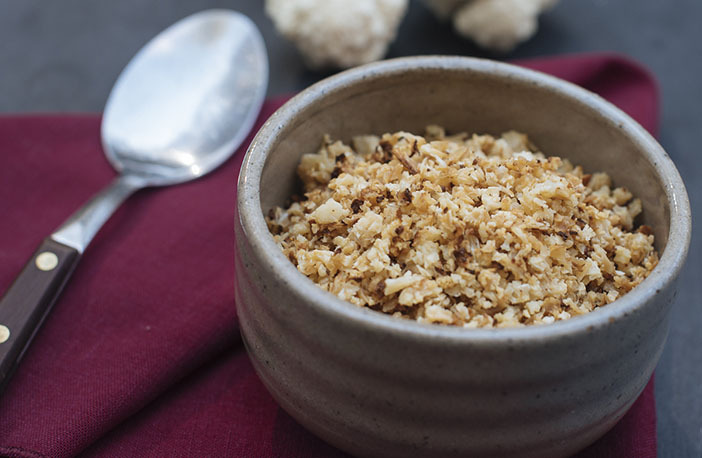 Place the cauliflower rice in a large bowl, add the melted coconut oil and salt. Toss with two wooden spoons until the rice is coated with the oil. Spread in a single layer on the baking sheet and roast until tender and beginning to get a few brown spots, about 25 minutes. Hey, Mel! What About Your Stovetop Rice Recipes? From now on, when I make my cauliflower rice recipes, I’m going to roast the cauliflower. It’s reliable, the work gets done in the oven without me needing to pay attention to it, and it’s far easier to double and triple recipes. YAY! Here’s how you can adapt the recipes in Well Fed and Well Fed 2 to this new technique. Here are the changes you can make to the recipe in the book to use the roasted rice: Roast the cauliflower rice as instructed above. Meanwhile, heat the coconut oil and add the apricots, raisins, pine nuts, onion, and garlic. Stir with a wooden spoon to combine and cook until the onions are translucent and the nuts start to brown, about 5 minutes. Push the onions to the side of the pan and add the remaining 1 tablespoon of coconut oil. Add the cumin and cinnamon to the oil, then stir everything together—oil, spices, onions, nuts, fruit—so they all mingle in happy harmony. When you can smell the spices, about 30 seconds, turn off the heat, toss in the roasted rice, and toss until everything is combined. Try a bite, then season with salt and pepper. Here are the changes you can make to the recipe in the book to use the roasted rice: Roast the cauliflower rice as instructed above. Meanwhile, heat the coconut oil and add the onions, cooking until the onions are translucent, about 5 minutes. Add the garlic and Aleppo pepper and stir-fry until fragrant, about 30 seconds. Add the ghee to the pan, along with the lemon zest and lemon juice. Toss in the roasted rice and stir until combined. Add the parsley, try a bite, then season with plenty of salt and a little pepper. BRILLIANT! I’ve never been a fan of cauliflower rice, and I tend to just ignore that it exists at all. But I’m going to try this because roasting improves anything. Thanks, Melissa! I can’t wait to try this technique! I’m making chicken & “rice” today & this should save me a lot of time. Thank you so much! Thanks! I was planning on mashing cauliflower tonight, but this sounds better! I’m imagining the texture will be more al dente like I like my rice. This is fantastic! I double or triple every recipe since my son eats us out of house and home. I can’t wait to try this! Thank you! Brilliant! Just “riced” two heads of cauliflower last night and stopped by the kitchen store and picked up 2 large cookie sheets on the way home. I’m ready to roast! 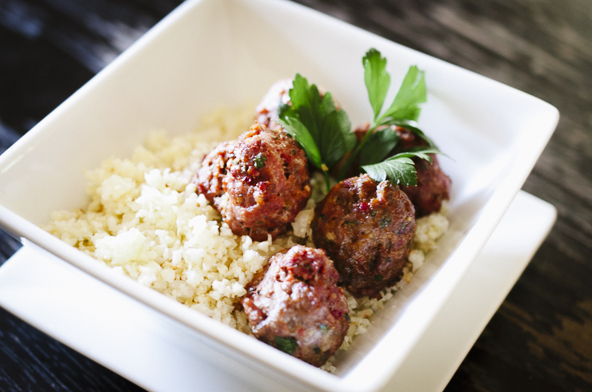 I love cauliflower rice, and I love meatballs, and win that they take the same amount of time. I believe I will be making cauli rice and meatballs soon. How thick a layer of cauliflower on the cookie sheet? Not very thick — maybe 1/2 inch, give or take. I use left over baked cauliflower rice in Ground chicken stuffed peppers in place of rice. Makes a yummy moist stuffed Peppers and porcupine balls in tomaote sauce ! Such a great idea! That all sounds delicious. I always grate my cauliflower when its raw and then put it in the microwave until its done. Is this method easier? And is microwaving it a big no no? I used to microwave mine, but I think the texture is a lot better if you don’t… although that depends on how you like to eat rice. I like mine fluffy and pretty dry, rather than wet-ish and soft. I think this method tastes a lot better and is easier than on the stovetop. I do this but I think other fats work better than coconut oil – I get more browning. I also like throwing it in the very hot oven then turning on the the broiler and toasting it to brown, tossing it, then toasting some more. Nom. Hi, Ann! What do you prefer instead of coconut oil? I really have trouble with the smell and would love to know what other fats work well at such a high heat. Thanks! Avacodo oil with duck fat is my favorite on this one. Is this a recipe that would work well with making a large batch and then freezing for later use? I don’t think cauli rice freezes well. I tried it a few times, and it just turns into smelly mush when it defrosts. You can make a large batch and eat it for 4-5 days, but I don’t recommend that you freeze it. I live on my own, so it can be hard to deal with portion sizes, and avoiding eating the same the for a week straight. I haven’t tried this yet, so this is just off the top of my head, but if you made a large batch of the rice in the oven and froze the portion that you don’t think you could eat within a few days, when you defrost it you could add it to soups and other things that don’t depend on the crisp rice texture. Oh I can’t wait to try this roasting method! I cook almost exclusively out of your 2 cookbooks and am currently in love with the coconut rice. Now I have to try it roasted with some meatballs on top! By the way, my favorite way to eat the meatballs is heated and cut into small pieces and tossed into sweet potato (white ones) salad (which is cold) that I make with mayo and black olives. The potatoes are sweet, the mayo is tangy, the olives are vinegary and the meatballs are little pops of heated meaty joy! I probably have this 2 weeks out of every month for dinner with a different meatball recipe each time! LOVE your recipes – my 2 cookbooks of yours look like they have been through a war zone as they are well-loved and covered in oil, sauce, bits of onions, etc. I’m so happy that you like the recipes in Well Fed and Well Fed 2 — thanks for letting me know! I also LOVE your idea for meatball salad. I’ve always thought it was weird that I liked hot meat with cold veggies and dressing — glad I’m not alone in that. This is awesome timing – making your Nanking chicken tonight with cauli rice. I love that I won’t have to babysit the rice now! Thanks! You can do the seasoning either way. If it’s spices, you could add them pre-roasting. For herbs, I’d add those at the en and toss with some fat. If you use my advice above as a guide under the heading, “Hey, Mel! What About Your Stovetop Rice Recipes?” you’ll get an idea of how you can do it. Glad you asked! I’m always happy to answer questions about paleo cooking. Hope you like the cauli rice! My household adores any vegetable tossed in fat and roasted. Literally any vegetable (okay, so Mom doesn’t like asparagus or Brussels sprouts… but everything else is fair game). You name it, its been roasted in my oven. I can’t even imagine what they’d do if I started roasting cauliflower rice. This, however, just confirmed that when I am finally financially independent and have my own home, having a double full-sized wall oven and separate range top has gone from Pinterestfantasy to absolute necessity. This is so genius. Thank you! You may have a recipe for this out there but please overlook my ignorance. I am new to the low Carb type world and wondered if this rice could be made into dirty rice. If so, would you have a recipe I could try? Thanks in advance!! YUMMY, i wish i was eating this right now! I tried cauliflower rice once before and hated it, so I was pretty skeptical about this. I made it tonight with Nom Nom Paleo’s Slow Cooker Chicken with Gravy. AMAZING. I mixed mine with ghee, garlic powder, salt and pepper. It took about 30 minutes for me at 425. Love, love, love. Will definitely be making this again. I tried this tonight and it was YUMMY. I bought a bag of florets from Costco and used almost the whole bag. I also used 2T of avocado oil instead of coconut and added about 15 minutes onto the cooking time. It was FABULOUS. Can’t imagine making it the old way ever again. THANK YOU! Thanks for all your wonderful recipes and ideas. I will be doing this tomorrow in my small paleo café. It will definitely cut down prep time and get more done at once. I will be attending the Paleo FX and will be looking out for you. Officially my new favorite way to fix Cauli Rice!! Thank you so much for this fab recipe! Just made some, it was delish and so easy I will be making caul rice on a regular now instead of avoiding. Had it with some pressure cooker curry. Thank you for this! I love the rice pilaf recipe, but it always did turn out a little mushy (or undercooked). Will try this as soon as I get to the store! Love this! I drizzled it with a little lime juice and some cilantro to serve with the citrus carnitas and bam! A little Mexican fiesta! Love Well Fed and so does my non-paleo (yet!) hubs! Made this tonight and it was fabulous. This will be my go-to cauliflower rice from now on. Thanks! Wow! I just made your citrus cauliflower rice this week for the first time. It was a HUGE hit! I used the left over to make a cauli-fritter……. sooo good. So tonight I am trying the roast techniche. I can only imagine how good it will be! I love the taste of roasted cauliflower. Yumm! Thank you! I can’t wait to try this! Just wanted to mention that I rice the stems too. I discard the dry ends, and peel the stem (like I would broccoli), then rice it in the food processor. Tastes great, less waste. I need to try this, I cook for 7 a lot so this is the best idea I have ever seen! I used your method with a twist last night. I finely chopped up two carrots & a generous quarter of an onion and roasted them right along with my cauliflower. I served it as a bed to some grass-fed beef roast that had just came out of the crock pot. For a little extra beefy goodness I added a few tablespoons of the liquid that came off the roast to the cauli rice before adding my beef. Hands down the best thing to happen to our Paleo repertoire all year! So much easier than on the stove top! I had avoided making Cauliflower Rice because of the hassle on the stove. Now going to be a weekly staple! Only criticism: you forgot one of the crucial ingredients! Onion! Easy fix: I pulse a large onion in the food processor after pulsing the cauliflower. Mix into rice and coconut oil seasoning. The smell from the oven is AMAZING!! Thank you so much for this. I’ve had no interest in cauli rice. We eat tons of cauliflower every week. But the idea of getting out the food processor and then trying to get it all cooked in my largest pan (12″ cast iron skillet) just sounded messy and undercooked. The roasting worked perfectly. Used coconut oil the first time since we were on a Whole30, used butter today. Just delicious and easy both ways! OH. MY. GOODNESS. Just made this to use up some cauliflower nearing the end of its prime, and it is AMAZING. I may never eat cauliflower any other way. Thank you! PS- Your cookbooks are one of the biggest reasons I’ve started to eat Paleo. I haven’t found a bad recipe yet! Thanks for all you do! Hmmm… I’m not sure. Now I want to try it! I *think* it could work if you just mix the ingredients together and spread them on a baking pan, but I’m not sure… it might not get infused with the coconut milk the way it does on the stovetop. If you try it, let us know how it turns out! Hi Mel, Love your site, your books, everything! Say, I’m hypothyroid, too, and am wondering if you never have problems with goitrogens? I know you said you weren’t autoimmune, but I’m wondering how many cruciferous lovelies before you’re left … unloved? I will never saute cauliflower rice again! Oven roasted is the way to go. Thanks a bunch!!! This is a neat trick, right?! Glad you like it! That should work just fine. Because you’re roasting and not baking (as in pastry baking), you have wiggle room regarding the temperature. The cauli rice might take a smidge longer to get toasty and lose its moisture, but it should be no biggie. I was very skeptical–really didn’t think that cauliflower could be a substitute for rice. But after trying your method I am a believer–I would substitute cauli rice for regular rice any day. Very surprised that it didn’t taste like cauliflower–didn’t really have much of a taste–kind of like white rice. Thanks! I’m glad you gave it a try. Neat trick, right?! I’m completely in love with this recipe. You mention tossing the cauliflower in a bowl with the coconut oil, and I’d just like to mention that what I do is use a Mist-o and just spray the coconut oil, I find it so much easier. Please tell me you have a Mist-o. Its the greatest thing since sliced bread. I’ve got one for coconut oil and one for EEVO. Oh, but I also should mention that I live in Vegas and my coconut oil is usually always in a liquid state. Thanks for the awesomeness. I made out with your citrus carnitas today as well. They are my new boyfriend. My husband says it’s cool. Instead od using a food processer try a cheese grater. Take the whole cauliflower head turn upside down and grate it to a couscous consistence. Works really well and does not go to mush. I’m coming late to the party, but tried your oven-roasting method to make your confetti rice from Well Fed last night (to go with Bora Bora Fireballs – yum!). The roasting worked so well – just the right texture and I loved the taste that the browning added to it. I’ll never nuke cauli-rice again! Thank you! Thank you so much for this! Tried this method tonight and the texture was absolutely perfect! I tossed it with some cilantro and lime juice and served with chicken ropa vieja. Amazing. If unable to use all the cauli-rice right away do you recommend coking the entire head at once and just reheating nor do you recommend reserving chopped cauli and only roasting what you’re gonna use? Either way works fine. It tastes *slightly* better if you roast it before eating, but reheating is really OK, too. Making this with some pesto shrimp… Yummm! I bought four bags of frozen cauliflower. Was less expensive than fresh. Will that work? I’ve never tried it with frozen; it *might* be too watery. Does aluminum foil vs. parchment paper make any difference? I have this in the oven right now with foil, but I usually prefer parchment and I’m not sure if there is an advantage of one over the other. Based on all the glowing reviews, I’m excited to try this out! Nope! It’s just for easier clean up. I literally just took it out of the oven and tried a bite. It’s amazing! So good! I added a little coconut aminos to mine before cooking. Wow. Just wow. I loved it! I wish I had two heads… No, four! I did one for dinner and didn’t get much (4 people sharing it). I CAN’T WAIT to make more tomorrow. Seriously, this is so simple and so yum! I’m breaking down and buying your cook books after 3 weeks on whole 30 using mostly your recipes. I’m glad you enjoyed it! It’s SO much easier to make large batches this way — you can do 4 heads on 2 baking sheets and have lots of leftovers. So glad I saw this! I am starting my Whole30 journey next week. One of my favorite breakfasts is an egg on white rice (weird, I know). Now I can still have it! OMG. Egg on rice is SO good! I hope you enjoy the cauli rice. Happy Whole30-ing! if you want to see my post, here is a link, hope it’s not a faux-pas to include it, let me know if you object to it and I won’t repeat the offense. I’m really glad you like this recipe and technique — so much easier/better than stovetop. I love that you’re excited about the recipe and totally appreciate the link back. Generally, it’s better for me if you don’t list the entire recipe on your site. You can share the ingredients list or a description — or even a photo — then link back to my site for the full recipe. That way we both get to enjoy the web traffic. No need to take down the cauli rice recipe; just a request for the future. Thanks so much for letting me know you like my recipes! That’s really sweet of you — but not necessary. Really. Thanks, though. Hi! I am starting Whole 30 soon (well, re-starting. Started earlier this year and had to redo as ended up with emergency appendix removal at the start of it (which – ha! – I initially thought was my body reacting to changing our diet and getting rid of bad for you foods! ), which resulted in people bringing us meals for the weeks I wasn’t allowed to do much), and I am excited to try many of your ideas. Thanks for sharing them! …What prompted me to finally comment, though, is that I just wanted to tell you that I love how gentle and kind you are in your comments to people. Even when there is an opportunity to respond with annoyance, I love that you take the higher road, give people the benefit of the doubt and reply with kindness. It’s a gesture I really appreciate after reading so many blogs where the replies to comments are often ones of annoyance or rudeness. So anyway, thanks for your recipes and equal thanks for your kind heart, so evident in your posts and replies. Thank you so much for this very sweet comment! I really appreciate you noticing… I *do* try to be compassionate. This nutrition stuff is not easy, and cooking doesn’t come naturally to everyone. I can be pretty snarky when talking about celebrities (I’m looking at you, Kim K.), but real people definitely deserve kindness and patience. Best wishes to you on your next Whole30. Emergency appendix removal?! Let’s not have anything crazy like that go down this time, OK? Drop me a line and let me know how you’re month is going! Happy cooking & eating! Ok, just changed the post…. hope it’s fine now! This is wonderful!!! This will take the place of conventional rice in my life. If I am doing a meatball with a sauce does the rice hold up well with the sauce or get mushy? If you cook the meatballs and sauce separate from the rice, then pile it on top of the roasted rice, you’ll be good to go. It doesn’t get any mushier than regular rice. Thank you! I made it to go with my curry today. Just posted a photo on instagram. LOVED IT! My new go to when low carbing. TY TY! This is one of my favorite recipes! I make almost every week. Waaay better than the stovetop version. Thank you!! Can’t wait to try this tonight. If I make a whole batch of this using 2 cauliflowers, does it keep in the fridge for reuse as say pilau? If so, for how long? I’ve had to go GF & have been trying out cauliflower crust for pizza but have had problems getting all the moisture out. I wonder if baking it would help??? I’m sorry – I really don’t know. I’ve never made cauliflower pizza. Citrus Cauli rice – So good! However, cauliflower rice, I dub thee…cauli-cous! That’s what the texture reminds me of. Thanks for the idea.since I like my cauliflower rice on the drier side, this is the best option. Tossed the cauliflower with Olive oil, garlic,Creole seasoning, diced onions and peppers, and andouille sausage for a scrumptious jambalaya! That sounds delicious! Glad you like this technique. First of all your website is amazing and incredibly helpful! My husband and I are about to embark on our first Whole 30 and you have provided a ton of helpful information!! So many of your suggestions call for coconut oil. I’m allergic to coconut (and all other tree nuts) and not much of a cook! What can I use instead of coconut oil? Thanks for all the work you do to help others find there way to healthier eating! So glad you’re enjoying the site! Have a great Whole30! Has anyone tried this with frozen cauliflower? It is hard to find fresh up here I the Great White North and the last one I purchased was 7 or 8 bucks! CRAZY, I know! Frozen is still reasonable and readily available. Love your books! You are a food artisan! I haven’t tried it, but I think it might work if you do it this way: Defrost the cauliflower and pat it dry with paper towels or a clean dish towel. Pulse it in the food processor — it should take more than 1-2 pulses to make the right texture. Then toss with fat and proceed. Let me know how it turns out! OMG. One pound bag of frozen cauliflower MIGHT yield 1 cup by volume of cauliflower in the end! It was pretty funny actually. I thought there would be enough for two! NOT. :-). I thawed in the bag for 30 min, then threw the partially thawed florets into the blender. (Probably not a good idea to thaw completely, as it would turn to total mush with the high water content.). Then I proceeded to lay the cauliflower bits on paper toweling and thawed the rest of the way. When I pulled out the toweling it was soaking wet. Baked according to the recipe and watched the 1 pound shrink away! If I were to do it again I would use 3 bags, but it seems unlikely. Someday cauliflower will become accessible and affordable again! I’ll use the frozen stuff for mash, but not rice next time. HA! Thanks for the update! Just goes to show much of veggies is really water… that’s nuts! If you have a craving for “rice,” and can’t get cauliflower you might try sweet potatoes. http://inspiralized.com/2014/03/11/part-1-takeout-fakeout-vegetarian-sweet-potato-fried-rice/ I haven’t tried that recipe yet, but Ali has a good reputation for her recipes. You could use her technique to make plain rice, maybe? Stored in the fridge, it should taste fresh for 4-5 days. Enjoy! Would frozen Trader Joe’s cauliflower rice work? Thank you! Sure! You don’t even need to defrost it. Just follow the instructions above. Just made this for the first time to serve with a Whole30 compliant Butter Chicken and it was fabulous! Lent a slightly nutty flavor to the chicken and was soooo easy to make. This is definitely my new staple! !